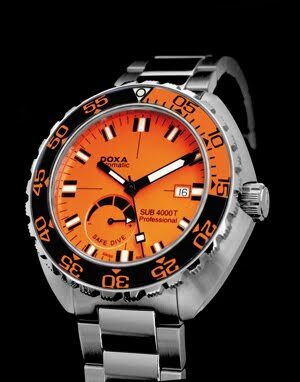 Joining the SUB 4000T collection, the latest dive watch from Doxa comes equipped with a sapphire crystal bezel. Unidirectional, as professional dive watch standards require, it indicates decompression stops in feet to guarantee performance and security in the most extreme conditions. Seasoned divers will also appreciate the luminescent hourmarkers and hands, the helium valve at 9 o'clock, and water-resistance to 1,220 metres. Not to mention its sporty good looks! Proposed as a 200-piece limited series.